Rift Valley fever is a mosquito-borne zoonotic disease that affects domestic ruminants and humans. Culex flavivirus is an insect-specific flavivirus that naturally exists in field mosquito populations. The influence of Culex flavivirus on Rift Valley fever phlebovirus (RVFV) vector competence of Culex pipiens has not been investigated. Culex flavivirus infection in a Cx. pipiens colony was studied by Culex flavivirus oral feeding and intrathoracical inoculation. Similarly, vector competence of Cx. pipiens infected with Culex flavivirus was evaluated for RVFV. Infection, dissemination, transmission rates and transmission efficiency of Culex flavivirus-infected and non-infected Cx. pipiens artificially fed with RVFV infected blood were assessed. Culex flavivirus was able to infect Cx. pipiens after intrathoracically inoculation in Cx. pipiens mosquitos but not after Culex flavivirus oral feeding. Culex flavivirus did not affect RVFV infection, dissemination and transmission in Cx. pipiens mosquitoes. RVFV could be detected from saliva of both the Culex flavivirus-positive and negative Cx. pipiens females without significant differences. Moreover, RVFV did not interfere with the Culex flavivirus infection in Cx. pipiens mosquitoes. Culex flavivirus infected and non-infected Cx. pipiens transmit RVFV. Culex flavivirus existing in field-collected Cx. 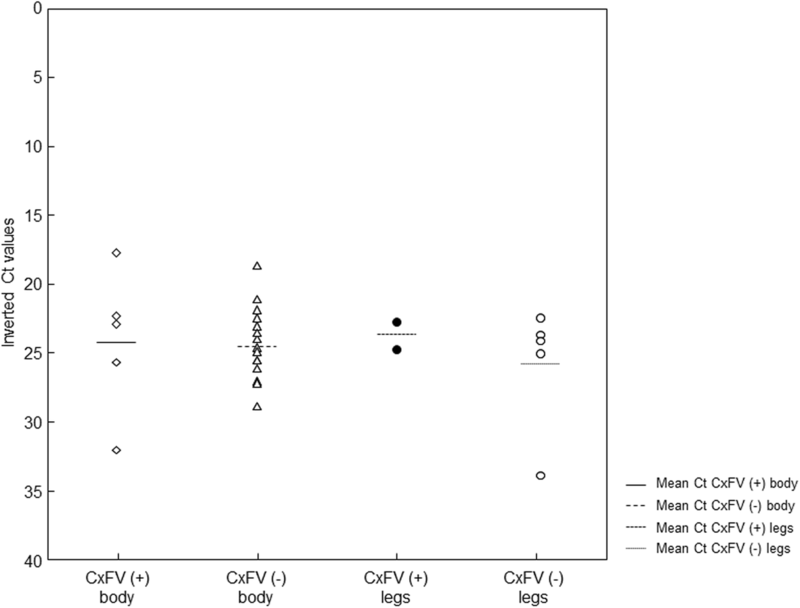 pipiens populations does not affect their vector competence for RVFV. Culex flavivirus may not be an efficient tool for RVFV control in mosquitoes. Culex flavivirus (CxFV) belongs to the genus Flavivirus (family Flaviviridae). The majority of viruses within this genus are transmitted horizontally between vertebrate hosts and hematophagous arthropods. However, some flaviviruses are considered to be vertebrate-specific while other group of viruses of this genus are insect-specific (ISFV) [1–3]. Circulation of ISFVs in natural mosquito populations is likely maintained by vertical transmission [4, 5]. In Europe, several species of ISFV have been detected in field mosquitoes from Italy, Portugal, Spain, the United Kingdom, the Czech Republic and Greece [6–10]. Sequences related to those viruses have been detected worldwide [11–14]. ISF RNA has also been detected in sand flies (family Psychodidae) in Algeria , Spain  and Portugal (GenBank: HM563684). Previous field studies in Spain suggested the existence of a large number of ISF [3, 15, 16], though not completely characterized phylogenetically . The circulation of ISFV in nature raises concerns regarding possible interactions with arthropod-borne flaviviruses  and even other arboviruses in vector populations. Co-infection studies with mosquito-borne flaviviruses (MBFV) and ISFV have been performed in order to gain a better understanding of any factor that could alter vector competence of mosquitoes for MBFV in both enzootic and epizootic transmission cycles . Three studies were carried out to directly address potential co-infection exclusion effect between CxFV and other flaviviruses such as West Nile virus (WNV) [18–20]. However, no co-infection studies with other pathogenic viruses belonging to other genera have been performed, such as Rift Valley fever phlebovirus (RVFV). Rift Valley fever (RVF) is a mosquito-borne zoonotic disease caused by RVFV (genus Phlebovirus, family Phenuiviridae). RVFV is transmitted by mosquito bites to a large number of hosts, both domestic and wild ruminants . Described for the first time in 1931 in Kenya , RVFV has continuously caused outbreaks in animals and humans in several African countries . In 2000, RVFV was first reported outside of Africa, i.e. in Saudi Arabia and Yemen , linking to the likelihood of a potential introduction of RVFV in Europe. The risk of RVFV introduction in Europe has been recently evaluated [25–28]. Results of a multiple criteria decision-making model study of key factors for RVF in Spain identified areas with high suitability for RVF outbreak occurrence in each month of the year . Moreover, a previous study has shown that a Culex pipiens mosquito colony from Spain is able to transmit this virus . Species of the genera Aedes and Culex are considered main vectors of RVFV . Culex pipiens complex is considered as an efficient RVFV vector  including Cx. pipiens and Cx. quinquefasciatus which are ubiquitous mosquitoes in temperate and tropical regions, respectively . It is relevant to understand ISF dynamics and their role in their mosquito hosts as potential control tool for vector-borne pathogens. To this end, the objectives of the present study were to evaluate (i) the CxFV infection in a Cx. pipiens colony by oral feeding and intrathoracic inoculation and (ii) the role in vector competence of CxFV for RVFV infection, dissemination and transmission by Cx. pipiens. All experiments were performed simulating environmental conditions of the season with high vector density and high suitability for RVF outbreak occurrence in the distribution area of the tested mosquito population. One mosquito population of Cx. pipiens pipiens and molestus hybrid form from Gavà (2012), Catalonia (northeastern Spain) was used. Molecular characterization of the Cx. pipiens forms was performed for each individual involved in the RVFV vector competence assay as previously described . The Cx. pipiens colony was reared in laboratory under environmental conditions: temperature, 26 °C:22 °C (day:night); relative humidity (RH) of 80%; and a 14:10 h (L:D) photoperiod including two crepuscular cycles of 30 min to simulate dawn and dusk. Before vector competence assays, the mosquito colony was tested for the presence of viruses, as described previously , to exclude other viral infections (species of Flavivirus, Alphavirus and Phlebovirus). In the last decade, other novel insect-specific viruses have been detected in field mosquitoes belonging to several families such us Bunyaviridae, Mesoniviridae, Reoviridae, Rhabdoviridae, Togaviridae and the newly recognized taxon of Negeviruses . Prior to vector competence assays, the colony was also tested for the presence of these viruses using generic RT-nested-PCR (unpublished) and Wolbachia spp. by PCR . The mosquito colony was found to be Wolbachia spp.-positive and negative for Flavivirus, Alphavirus, Phlebovirus, Bunyaviridae, Mesoniviridae, Reoviridae, Rhabdoviridae, Togaviridae and Negeviruses (data not shown). The CxFV strain was detected in field-collected Culex pipiens mosquitoes captured in Huelva, Spain, in 2006, and isolated in C6/36 cells. To propagate the virus, C6/36 cells were incubated for 6–7 days (28 °C, 5% CO2) and viral particles were observed by electronic microscopy. As cytopathic effect was not observed, CxFV replication was detected in the supernatant using a modified real time RT-PCR  (see below). A monolayer of C6/36 cells was used to titrate CxFV. Briefly, eight wells were infected for each ten-fold dilution. Twenty microliters of inoculum and 150 μl of minimum essential medium (Life Technologies, Carlsbad, CA, USA) supplemented with 2% FBS (EuroClone SpA, Pero, Italy), 2 mM L-glutamine, non-essential amino acids, 1000 U/ml of penicillin, 10 mg/ml of streptomycin and 500 U/ml of nystatin (all from Sigma-Aldrich, St. Louis, MO, USA), were added into each well as post-infection medium. Plates were incubated at 28 °C and 5% of CO2 for 7 days. Calculation of the viral titer was performed by virus detection in each well using real time RT-PCR. Ct-values ranged between 21.09–23.48 in the wells where the virus replicated. The 50% tissue culture infective dose per milliliter (TCID50/ml) was calculated using the Reed & Muench method . The virulent RVF 56/74 strain (passages history  and one passage in C6/36 cells) was propagated in BHK-21 cells. The virus was titrated in Vero cells and cytopathic effect was observed. The 50% tissue culture infective dose per milliliter (TCID50/ml) was also calculated using the Reed & Muench method . Fourteen-day-old Cx. pipiens females were exposed for 60 min to CxFV infected blood (1:2) at 4 log10 TCID50/ml using the Hemotek feeder system. At 0, 3, 5, 7 and 10 days post-exposure (dpe), six fed females were harvested and frozen until analysis. A group of 36 Cx. pipiens females, 2–3 days of age, were intrathoracically inoculated with CxFV at 4 log10TCID50/ml diluted 1:2 in Dulbecco’s modified Eagle medium (DMEM). To study virus replication kinetics, these females were examined at 0, 3, 5, 7, 9 and 11 days post-inoculation (dpi). Bodies were analyzed from the 36 mosquitoes and saliva was harvested from all mosquitoes except from those corresponding to 0 dpi. Saliva was collected using a capillary technique as previously described . As an inoculation control, a group of mosquitoes was inoculated with only DMEM. The ability of RVFV to infect, disseminate and be transmitted by Cx. pipiens infected and non-infected with CxFV was evaluated by: infection rate (IR), disseminated infection rate (DIR), transmission rate (TR) and transmission efficiency (TE). IR refers to the proportion of mosquitoes with infected body among tested mosquitoes. DIR corresponds to the proportion of mosquitoes with infected legs/wings among the previously detected infected mosquitoes (i.e. body positive). TR represents the proportion of mosquitoes with infected saliva among mosquitoes with disseminated infection. TE represents the proportion of mosquitoes with infected saliva among the total number of mosquitoes tested . Seven- to nine-day-old female mosquitoes that had never been blood-fed were used. Mosquitoes were reared and fed as previously described . Culex pipiens intrathoracically inoculated with CxFV or with DMEM were tested for vector competence (VC) using a RVFV viral dose of 7.23 log10TCID50/ml. After the blood-feeding, CO2 was used to anesthetize the mosquitoes and fully-engorged females (FEF) were selected. The blood doped with RVFV was titrated in Vero cells. Ten percent of the specimens from each group were sacrificed and analyzed as a control of the inoculum. The rest of the mosquitoes were individually placed to cardboard cages (Watkins & Doncaster, Leominster, UK). FEF were fed with sucrose (10%) ad libitum using soaked cotton pledgets. The presence of viral RNA in saliva was evaluated using two different approaches: FTATM cards (GE Healthcare, Little Chalfont, UK) soaked with Manuka honey (Manuka Health New Zealand, Te Awamutu, New Zealand) and a blue alimentary colorant, at 4 and 14 dpe and the direct extraction of mosquitoes’ saliva by capillarity at 14 dpe. At 4 and 14 dpe the FTA cards were left 24 h on the top of the mesh screen of all cardboard cages to allow the mosquito to feed on it. After FTA cards collection, they were resuspended in 0.3 ml of PBS and stored at -80 °C until tested. At 14 dpe, every mosquito was anesthetized with CO2 and dissected, and samples (legs/wings and bodies) were collected as previously described . One hundred-fifty microliters from the saliva sample contained in DMEM medium were used for viral RNA extraction and the remaining 50 μl were used for RVFV isolation in a Vero cells monolayer. 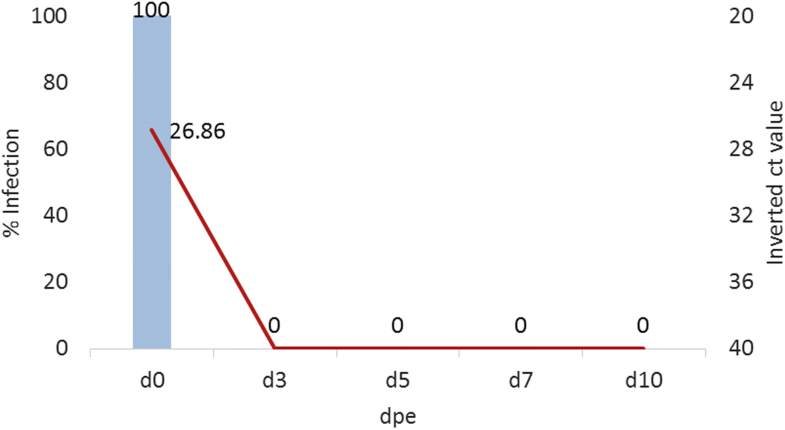 Cells were incubated for 7 days (37 °C, 5% CO2) and the cytophatic effect was evaluated. CxFV detection was performed using the real time RT-PCR protocol described by Bolling et al. with minor modifications. The primer CxFV-F was modified as follows: 5'-CTA CGC TCT TAA CAC AGT GA-3' and RT-qPCR was carried out using Quantitec SyBr Green RT-PCR kit (Qiagen, Hilden, Germany). Samples were amplified using a 7500 Fast Real-Time PCR System (Applied Biosystems, Foster City, CA, USA) programmed as follows: 50 °C for 10 min, 95 °C for 10 min, 45 cycles at 95 °C for 15 s and at 57 °C for 35 s. RVFV RNA was extracted and detected as previously described . The frequency with which CxFV (+) and CxFV (-) mosquitoes get infected, disseminate, and transmit RVFV was compared by Fisher’s exact test. Ct-values in mosquito bodies, legs/wings and saliva 14 dpe were compared between CxFV (+) and CxFV (-) groups by a non-parametric Mann-Whitney test as data were not normally distributed. Differences in Ct-values in CxFV inoculated mosquitoes among dpi were assessed by means of a multiple comparisons Kruskal-Wallis test. P-values < 0.05 were considered statistically significant. No CxFV replication was detected in Cx. pipiens exposed orally, suggesting that Cx. pipiens mosquitoes are not susceptible to CxFV infection by oral exposure. Although no positive CxFV was recorded in any tested female mosquito on 3, 5, 7 and 10 dpe, CxFV could be detected in all mosquito samples collected on 0 dpe, demonstrating that all mosquitoes were exposed to the virus (Fig. 1). Culex pipiens intrathoracically inoculated with CxFV showed viral replication. Results demonstrated a high percentage of CxFV infection detected at all time-points analyzed. The obtained Ct-values were high, indicating low viral load. However, the multiple comparison Kruskall-Wallis test detected significant differences in viral loads among dpi (H = 16.692, df = 5, P = 0.005). 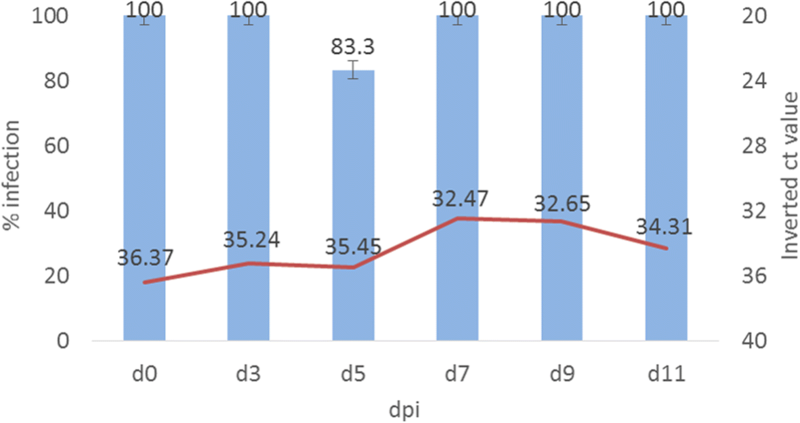 The multiple comparisons of mean ranks indicated that the viral load in bodies of females tested at 7and 9 dpi was significantly higher than at 0 dpi (z = 3.33, P = 0.012 and z = 3.06, P = 0.033, respectively), showing CxFV replication within Cx. pipiens after intrathoracic inoculation (Fig. 2). All saliva samples tested at different time points were negative to CxFV. CxFV replication was not affected by RVFV exposure in female Cx pipiens mosquitoes. Results showed that 21 days after CxFV inoculation and 14 days after RVFV exposure (14 dpe), bodies of all tested females remained positive to CxFV without significant differences (Fig. 3). Mosquitoes infected with CxFV and exposed to RVFV (n = 10; n = 1 hybrid form and n = 9 molestus form) and mosquitoes non-infected with CxFV and exposed to RVFV (n = 22; n = 5 hybrid form and n = 17 molestus form) were analyzed at 14 dpe. The percentages of RVFV infection, dissemination and transmission in analyzed mosquito females were not significantly different between females infected and non-infected with CxFV (Table 1). Moreover, RVFV loads in bodies and legs/wings were not significantly different between females infected and non-infected with CxFV (Fig. 4). All RVFV-positive saliva were detected in females with disseminated infection at 14 dpe. The Ct-values in mosquito saliva did not differ significantly between both groups, infected and non-infected with CxFV (Table 2). In addition, RVFV was detected in bodies, legs/wings or saliva of mosquitoes with (n = 27) and without (n = 5) Wolbachia (Table 2). Regarding the forms of individuals from the Cx. pipiens hybrid colony, RVFV was detected in mosquito bodies, legs/wings and saliva of Cx. pipiens form molestus and in mosquito bodies of the hybrid form (Table 3). The isolation, identification and characterization of numerous insect-specific viruses in recent years are of particular interest. They can coexist with pathogenic arboviruses in mosquito populations and may potentially affect the transmission of vector-borne infectious diseases. While there is extensive genetic and phenotypic characterization of insect-specific flaviviruses, little is known about the interactions between them and their mosquito hosts and other arboviruses and the potential public health significance of these associations . Relatively few studies have been performed on co-infections with other flaviviruses such as WNV [18–20]. To the best of our knowledge, the present study is the first to perform a co-infection with two viruses from different genera, CxFV (Flavivirus) and RVFV (Phlebovirus). The mechanism through which natural mosquito populations become infected with CxFV is not yet well defined. Our results strongly suggest that Cx. pipiens females are not susceptible to CxFV upon oral exposure. This is in agreement with previous studies showing transmission of insect-specific viruses solely among their invertebrate hosts by vertical route [1, 5]. Intrathoracic inoculation of CxFV in our study, however, indicates that the virus may have the potential to replicate in Cx. pipiens females at least for 21 days, establishing a possible CxFV persistent infection. 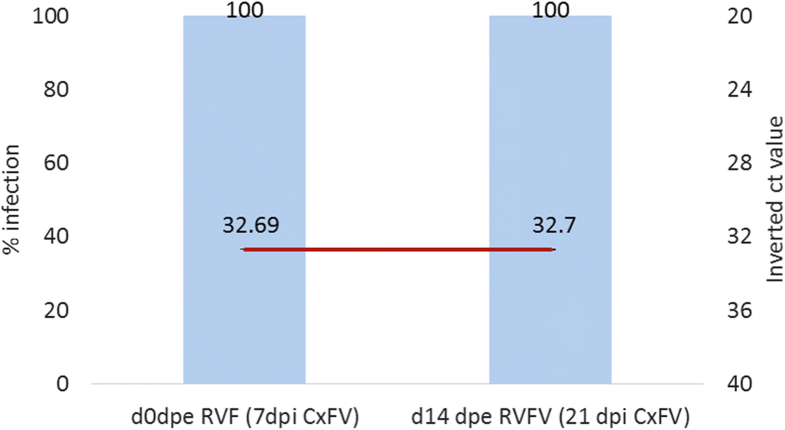 Nevertheless, CxFV could not be detected in saliva after 14 dpi. Our results are in line with a previous report by Kent et al. who showed that CxFV Izabal intrathoracically inoculated to Cx. quinquefasciatus females was not found in the saliva. Vector competence for RVFV was examined at 14 dpe in one Cx. pipiens colony artificially infected with CxFV by intrathoracic inoculation. The percentage of mosquito females that became infected, developed a disseminated infection, and transmitted RVFV was not significantly different between females infected and non-infected with CxFV. We assume that CxFV may have co-evolved with their mosquito host evading their immune system without affecting its function against a subsequently-infecting virus. As such, the molecular mechanisms that allow co-existence of both CxFV and RVFV are not well defined and need more extensive studies. Furthermore, RVFV RNA levels observed were also not significantly different suggesting that CxFV does not affect RVFV replication. This is in agreement with other published studies where co-infection of CxFv and WNV has been performed. Similarly, Kent et al. investigated the vector competence for WNV of Cx. quinquefasciatus mosquitoes intrathoracically inoculated with CxFV Izabal, and also observed no significant differences in WNV titers between CxFV-positive and CxFV-negative mosquitoes at 14 dpi. Another study that tested the vector competence for WNV in two Cx. pipiens colonies , one colony CxFV naturally infected and the other CxFV non-infected, reported no significant differences in WNV dissemination between both colonies at 14 dpe. However, significant differences were observed at 7 dpe, being significantly higher in the CxFV-negative colony than in CxFV-positive colony. These results suggested a competitive interaction between CxFV and WNV indicating a possible early suppression of WNV replication by CxFV infection in Cx. pipiens. Vector competence is influenced by the time-point examined and by genetic differences between mosquito populations  as well as genetic diversity and fitness of a laboratory colonized population [41, 42]. All these factors must be taken into account for co-infection studies in mosquitoes. The Cx. pipiens colony used in the present study was naturally infected by Wolbachia spp. This may have influenced the vector competence of infected mosquitoes as shown in a previous study . Our results showed that RVFV was detected in bodies, legs/wings or saliva of mosquitoes with (n = 27) and without (n = 5) Wolbachia. Due to the small sample size, further studies regarding this issue are needed to explain the potential interference of Wolbachia in arbovirus-vector interactions. The present study and our previous report  allow us to assure that the Cx. pipiens hybrid colony of Gavà can become infected, disseminate and transmit RVFV. The IR and DIR obtained were lower than those reported by Turrell et al. when a Cx. pipiens hybrid colony was exposed to a similar RVFV viral dose (107.5 PFU/ml) at 14 dpe. Regarding the forms of Culex pipiens, RVFV was detected in mosquito bodies, legs/wings and saliva of Cx. pipiens form molestus (n = 26 tested). Thus, our findings in the present work also showed that the individuals of molestus form within the hybrid colony disseminated and transmitted RVFV. However the virus was only detected in mosquito bodies in hybrid form (n = 6). These results may suggest that the individual form might determine the RVFV dissemination and later transmission, suggesting a strong midgut barrier in hybrid form in Cx. pipiens individuals. The insect’s immune responses largely determine the viral load, extrinsic incubation period, and mortality of the insect vector after viral infection, all of which directly affect the outcome of disease transmission [45, 46]. Exposure to one microorganism can provide cross-protection against another microorganism. Specific examples of the super-infection exclusion hypothesis based on the idea of homologous interference, which is the ability of an established infection with one virus to interfere with secondary viral infection, has been documented in cell culture not only with flaviviruses [47–50], but also with other arboviruses of the genera Alphavirus , Orbivirus  and Vesiculovirus [53, 54]. The study of Bolling et al. reported that CxFV could alter the WNV infection on mosquitoes although it did not exclude WNV infection. However, a positive correlation between WNV and CxFV infection of field-collected Cx. pipiens mosquitoes from Illinois has been observed, suggesting that there could be a biological suppression that mediates an increasing susceptibility to naturally WNV infected mosquitoes . Moreover, WNV transmission was enhanced in the Honduras colony when mosquitoes were inoculated simultaneously with WNV and CxFV Izabal . To our knowledge, nothing was known about the potential interference of CxFV in the mosquito infection by other arboviruses not belonging to Flavivirus genus. Our results, for the first time, indicate that CxFV infection in Cx. pipiens might not alter the immune system to interfere with the RVFV infection in case of RVFV introduction in Cx. pipiens populations. This is the first study to assess the potential interference of an ISF on RVFV transmission. We have shown that CxFV does not affect RVFV infection, dissemination and transmission. Mosquitoes persistently infected at the assessed conditions may not be used as a preventive intervention strategy for blocking the transmission of RVFV. Further studies using mosquitoes naturally infected with CxFV should be performed to deepen the knowledge in the natural CxFV infection and to elucidate consistent trends for RVFV vector competence in CxFV artificially and naturally infected Cx. pipiens populations. Altogether, it is necessary to highlight the importance of deepening the knowledge on the interaction of ISF circulating in mosquito populations present in an area where the potential pathogenic arboviruses can be introduced in order to better assess arbovirus risk transmission. Examining associations between insect-specific viruses such as CxFV and RVFV and other arboviruses important for human and animal health will provide significant new insights into both arbovirus biology and public health. The authors would like to thank Dr Carles Aranda, Consell Comarcal del Baix Llobregat, Barcelona, Spain, for providing the mosquito populations and Dr Alejandro Brun for providing the RVFV strain. The authors are very grateful for the excellent technical contributions of Marta Verdún, Núria Pujols and Raquel Rivas from CReSA (IRTA). This project was funded by the CERCA Programme / Generalitat de Catalunya and the Spanish Government (grant no. MINECO AGL2013-47257-P). NB conceived and designed the study. AV isolated CxFv from field-collected Culex pipiens and tested mosquitoes for Bunyaviridae, Mesoniviridae, Reoviridae, Rhabdoviridae, Togaviridae and Negeviruses viruses. ST, LB and AN performed the experimental assays. FM, ST and NB analyzed the results. NB and ST drafted the manuscript. All authors read and approved the final manuscript.